Acute respiratory distress syndrome (ARDS) is a serious reaction to various forms of injuries or acute infection to the lung. ARDS is characterized by inflammation of the lung parenchyma leading to impaired gas exchange with concomitant systemic release of inflammatory mediators causing inflammation, hypoxemia, and frequently resulting in multiple organ failure. This condition is often fatal, usually requiring mechanical ventilation and admission to an intensive care unit. People with ARDS usually present with shortness of breath, tachypnea leading to hypoxia, and providing less oxygen to the brain occasionally causing confusion. acute respiratory distress syndrome: Acute respiratory distress syndrome (ARDS) is a serious reaction to various forms of injuries or acute infection to the lung. ARDS is a severe lung syndrome (not a disease) caused by a variety of direct and indirect issues. Acute respiratory distress syndrome (ARDS), also known as respiratory distress syndrome (RDS) or adult respiratory distress syndrome, is a serious reaction to various forms of injuries or acute infection to the lung. ARDS is a severe lung syndrome (not a disease) caused by a variety of direct and indirect issues. It is characterized by inflammation of the lung parenchyma leading to impaired gas exchange with concomitant systemic release of inflammatory mediators causing inflammation, hypoxemia, and frequently resulting in multiple organ fail. This condition is often fatal, usually requiring mechanical ventilation and admission to an intensive care unit. 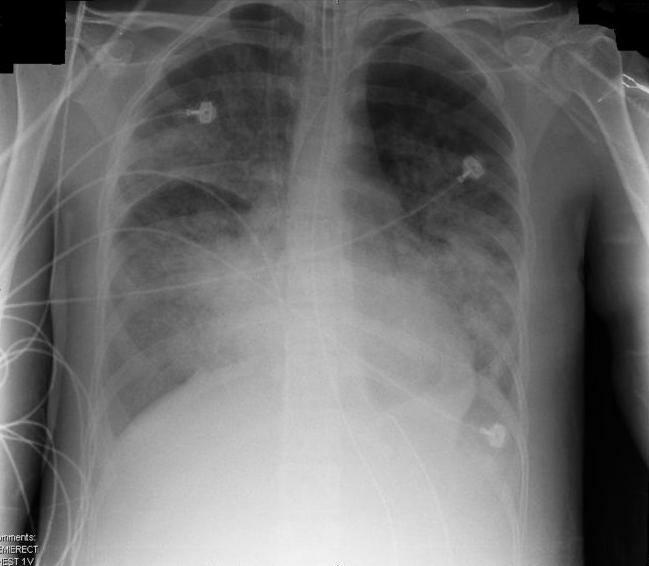 X-ray of patient with ARDS. : Chest x-ray of patient with ARDS. People with ARDS usually present with shortness of breath, tachypnea leading to hypoxia, and providing less oxygen to the brain occasionally causing confusion. ARDS can occur within 24 to 48 hours of an injury (trauma, burns, aspiration, massive blood transfusion, drug/alcohol abuse) or an acute illness (infectious pneumonia, sepsis, acute pancreatitis). It is characterized by bilateral infiltrates on chest radiograph sparing costophrenic angles and pulmonary artery wedge pressure < 18 mmHg (obtained by pulmonary artery catheterization). Mechanical ventilation is an essential part of the treatment of ARDS to relieve respiratory muscles of their work, and to protect the usually obtunded patient’s airways. Ventilation is usually delivered through oro-tracheal intubation, or tracheostomy whenever prolonged ventilation (≥2 weeks) is deemed inevitable. However, mechanical ventilation may constitute a risk factor for the development, or the worsening, of ARDS. Aside from the infectious complications arising from invasive ventilation with tracheal intubation, positive-pressure ventilation directly alters lung mechanics during ARDS. The result is higher mortality, i.e., through baro-trauma, when these techniques are used. If the underlying disease or injurious factor is not removed, the amount of inflammatory mediators released by the lungs in ARDS may result in a systemic inflammatory response syndrome (or sepsis if there is lung infection). The evolution towards shock and/or multiple organ failure follows paths analogous to the pathophysiology of sepsis. This adds up to the impaired oxygenation which is the central problem of ARDS, as well as to respiratory acidosis, which is often caused by ventilation techniques such as permissive hypercapnia which attempt to limit ventilator-induced lung injury in ARDS. The result is a critical illness in which the “endothelial disease” of severe sepsis/SIRS is worsened by the pulmonary dysfunction, which further impairs oxygen delivery. Appropriate antibiotic therapy must be administered as soon as microbiological culture results are available. Empirical therapy may be appropriate if local microbiological surveillance is efficient.